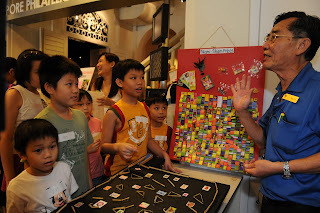 If you're still not sure of which museum to visit during International Museum Day on 31st May, perhaps some of the activities organised at the Philatelic Museum will tempt you. Free activities include a colouring station where children can use unique stamp template designs to create their own picture, as well as a fun quiz where kids can challenge their knowledge of the amazing world of stamps. There will also be free tours (11am-12noon, 2pm-3pm) of the collections and exhibitions as well as a free Cooking with Milk demonstration (3pm-4.30pm) which ties in with the exhibition The Cow and Bull Story. For SG$5 you can have a caricature of yourself done as your favourite superhero, and there will be a comics bazaar where you can buy collectable comics and related materials. The staff at this unique museum are always friendly and welcoming and I'm sure it will be a interesting day for all.